Taking inspiration from small strikes and actions over the past few years, OUR Walmart activists struck a note of dissent at the corporation’s annual party. After a parade of drummers, umbrella-twirlers and elephant puppets—and before Walmart’s US president called a couple employees up on stage for on-the-spot promotions—striking Walmart worker Janet Sparks was granted three minutes to address the company’s June 7 shareholder meeting. Her eyes alternating between her typed speech and the thousands of stock-owners and co-workers packing Bud Walton Arena, Sparks dissented from Walmart’s star-studded celebration of itself. Reading nervously but steadily, Sparks described a company that understaffed, underpaid and over-relied on temps. This wasn’t Janet Sparks’ first trip to Walmart’s annual Arkansas gathering. Three years ago, she attended the same way thousands of other Walmart “associates” do: by being hand-picked and flown in by management. That year, she came up to Mike Duke alone in the arena after the meeting to ask him to help bridge what she called a “moat” insulating management from the experiences of rank-and-file employees. A lot has changed since then. In 2011, working closely with organizers from the United Food and Commercial Workers union, a hundred employees launched OUR Walmart, labor’s latest effort to force change at the nation’s largest employer and pioneering union-buster. Last year, the group pulled off the first coordinated US strikes in Walmart’s five-decade history, culminating in a high-profile walkout by more than 400 workers on Black Friday. The Arkansas Democrat-Gazette reported that Walmart executives devoted portions of their remarks at an employee meeting to bashing OUR Walmart activists, whom they described as paid agitators who thought employees weren’t smart enough to judge their jobs for themselves. The striking workers’ challenges in engaging those hand-picked co-workers are revealing. Along with whatever slice of Walmart’s workforce is genuinely content with their working conditions, OUR Walmart members say there’s a silent majority in their stores that would like to see change but has a well-founded fear that trying to improve their job would leave them without one. 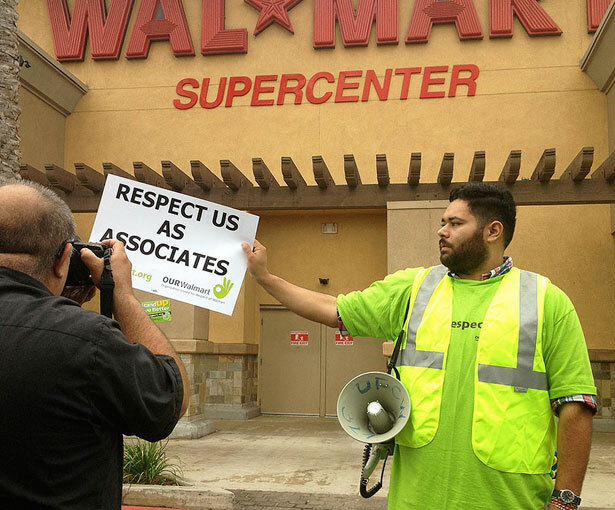 A May report from the union-funded nonprofit American Rights at Work–Jobs with Justice tallied over 150 incidents of alleged intimidation against OUR Walmart worker-activists, from barely veiled threats to retaliatory firings. Walmart workers are up against a labor law system that’s fixed in favor of corporate interests. While the law promises workers the chance to choose collective bargaining, it’s proven largely useless for compelling companies like Walmart to concede power, and it’s done all too little to shield workers who try to make good on that promise. The Walmart-ization of the US economy—more poverty jobs, more precarious work, more layers of sub-contracting that confound accountability—has been both a cause and a consequence of labor’s declining leverage on the job and in our politics. The still-young OUR Walmart campaign shows some of the ways labor’s trying to meet the challenge. Faced with the limits of labor law, unions are increasingly supporting or seeding “alt-labor” efforts like OUR Walmart, which mobilize workers outside collective bargaining. Stymied at the Labor Board or the bargaining table, union and non-union workers are turning to a range of “comprehensive campaign” tactics, marshaling a mix of workplace activism and consumer, media, political and legal pressure in an effort to make companies miserable enough to concede (over the week in Arkansas, strikers floated ideas ranging from a political push for more regulation on Walmart to a one-day consumer boycott). And, most dramatically, even as some major unions have largely abandoned the strike, non-union workers are taking it up. Janet Sparks says her store’s story offers cause for hope. Sparks first reached out to OUR Walmart in 2011: after reading about the group online, she sent an e-mail telling organizers the same concerns she’d tried to voice to Mike Duke, and saying that while she wouldn’t want any part in an “anti-Walmart” group, she hoped OUR Walmart would offer a way to save the company from itself. As with many other current OUR Walmart leaders, online conversations laid the groundwork for in-person organizing. On Black Friday, while Sparks’ co-workers were too scared to participate, she was among a handful of employees across the country who went on strike without anyone else from their store. That’s the paradox of these strikes: They both run the risk of retaliation and offer workers’ strongest weapon for punishing it. And judging by history, how Walmart responds will depend on what the company believes it can get away with and whether a given tactic is more likely to chill organizing or inflame it. That in turn depends on how many Walmart workers choose to defy their fear and join their co-workers. With the shareholder circus and the strikers’ counter-spectacle now concluded, that’s the question now hanging over Walmart stores. The strikers have made history, and offered hope to workers in far-flung parts of the economy. They can credibly claim to have forced some response (witness Walmart’s announced plans to improve its scheduling system). And Walmart has given its critics ample ammunition, from a widening foreign bribery scandal to the mainstream media reports suggesting that its understaffing is alienating its customers. But as the previous decade proved, Walmart is willing to suffer through some bad press, and would rather spend money than concede power. And so whether OUR Walmart activists can truly transform the world’s biggest company depends on whether they can move co-workers like the ones that Walmart flew to Bentonville. The Supreme Court ruled that Arizona’s voter suppression law violated the National Voter Registration Act. Read Ari Berman’s report here.